You don’t have to be “advanced” to take this class – it’s designed to advance your scuba diving skills, so you can start right after earning your PADI Open Water Diver certification. This course substantially increases your comfort while building your confidence. You expand your scuba skills from the basics to the more advanced and it shows in your diving. This course builds on what you’ve learned and develops new capabilities by introducing you to new activities and new ways to have fun scuba diving. The Open Water course taught you how to dive, but it didn’t make you a good diver. This course builds on what you’ve learned and develops new skills that make the experience more fun, safer, and most of all comfortable. You will advance to Level 3 Advanced diver. No other agency lets you to choose your 4 specialties and get a complete certification in all 4. Pick your favorites and save with a tremendous bundle savings. Example, Perfect Buoyancy at $180, Drysuit at $270, Nitrox at $180, and maybe Deep at $180. Taken separately it would total $810. With Level 3 Advanced training it is $550. And you absolutely, positively, will become a better diver and will enjoy the experience so much more. Only at Coral Key Scuba. Advanced Diver Digital Certification Card includes the certification in all the specialty courses you chose. Completion of the 4 Specialties of choice. Upon completion of the 4 specialties you will need a minimum of 24 logged dives total to received the Level 3 Advanced Diver Certification. As a certified diver already, you will enjoy the advanced training. Classroom and Pool instruction learning the skills that help you become a more skilled diver. Students will also discuss what to expect from different diving locations and real world scenarios. Each specialty has it’s own unique certification requirements. Some will require open water scenarios and others only pool dives. Advanced students will require a minimum of 5 dives to complete the specialty requirements. Price: $550 Includes 4 specialties. Local (Coral Sea) - Join us during the summer months at Coral Key's OWN private lake, the Coral Sea, less than 5 minutes from our store. Group Trip - Come join us on one of our instructor-lead, exotic diving vacations offered year around. This option provides a great opportunity to meet other divers of all backgrounds and skill levels. Package prices are listed as per person. Blue Hole/winter certification dives require an additional cost of $65, a minimum of 6 students and does not include transportation, lodging, or meals. 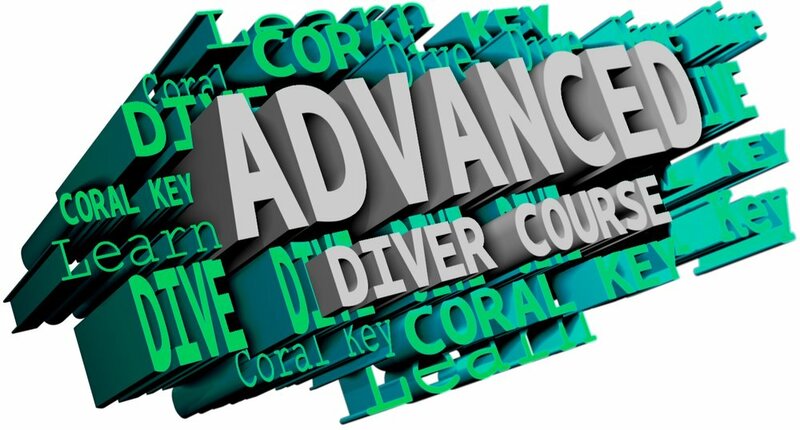 Coral Key Scuba & Travel - Advanced Open Water Scuba Certification course.